ORPHEUS at the BBC’s Sounds Amazing conference (photo: BBC). 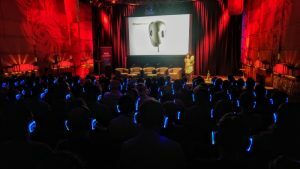 Following the success of “Sound: Now and Next” in 2015, the BBC brought hundreds of audio producers and technologists back to Broadcasting House in London for a full day conference called “Sounds Amazing” on 2nd May 2018. The event included talks from the producers of inspiring works such as Blue Planet 2, and featured a technology fair sponsored by the S3A project that showcased the latest audio technology. The talks included a session on immersive audio, which memorably demonstrated the power of binaural audio using hundreds of wireless headphones with an on-stage dummy head microphone (see picture). The talks also featured a number of object-based audio experiences, such as an interactive voice-controlled drama, and a demonstration of media device orchestration. ORPHEUS exhibited in the technology fair, where we presented The Mermaid’s Tears interactive radio drama, and our iPhone app that showcases a variety of object-based experiences. The event received such positive feedback that it will now be run as a regular bi-annual event.